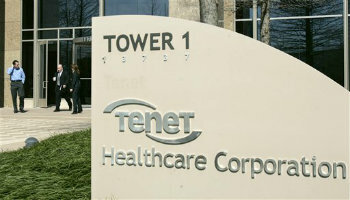 Tenet Healthcare Corp. reported earnings that beat analysts estimates as the hospital company saw increased revenue from higher admissions and fewer uninsured patients under Obamacare. Nov. 3 (Bloomberg) — Tenet Healthcare Corp. reported earnings that beat analysts estimates as the hospital company saw increased revenue from higher admissions and fewer uninsured patients under Obamacare. Tenet’s net income fell to $9 million after tax, or 9 cents a share, from $28 million, or 27 cents a share, in the third quarter a year earlier, the Dallas-based company said today in a statement. Earnings were hurt by a $95 million increase in pretax interest expense related to the financing of its 2013 acquisition of Vanguard Health Systems and share repurchases.